Walkie-talkies have been a staple of communication in public safety and recreational use since they were first developed in the 1930’s. The technology of walkie-talkies has come a long way since their first incarnation as backpack-sized devices used by the military in World War II. There are many different options and features available for walkie-talkies in the current market, and walkie-talkie watches are a convenient tool to take advantage of the ease of communication with two-way radios. What makes a walkie-talkie watch different from standard handheld radios? Are walkie-talkie watches as reliable and durable as your typical walkie-talkie? There are many options out there for purchasing a walkie-talkie watch, and with similar price points and attractive features, they can be a great option for outdoor and recreational adventures. We’ve researched some of the best walkie-talkie watches on the market to give you a rundown of what to look for before you make your purchase! The Vectorcom wrist walkie-talkie is a great option for a portable solution to communication by two-way radio. With a variety of features and attractive, comfortable design, this walkie-talkie watch is specifically marketed as a perfect communication tool for outdoor sports and hiking adventures. With a light-weight design and intuitive control options, the Vectorcom wrist walkie-talkie takes the world of wearable walkie-talkies to a new level. A variety of channel options and an auto-scan feature allows you to stay connected to your group in rugged areas where cell phones can’t be used for communication. The Vectorcom walkie-talkie watch also comes equipped with an auto-squelch feature to further reduce noise and interference during voice transmissions. An internal VOX voice-activated system makes handsfree communication a breeze, and each walkie-talkie watch is equipped with a headphone jack for earbuds as well as an internal microphone. The Vectorcom digital wrist walkie-talkie runs on rechargeable lithium-ion batteries that boast a 24 hour standby time and three hour talk time. Adding value to your purchase, each set comes with an AC power adapter for convenient charging. The AGPtek wristwatch walkie-talkie is leading the way into the next generation of walkie-talkie communication devices. Featuring cutting-edge technology and up to a 6 km range, this walkie-talkie watch is perfect for the recreational enthusiast. What sets this walkie-talkie watch apart from the rest of the products we reviewed is AGPtek’s wrist-operated technology. With this walkie-talkie watch you now have the option to activate voice transmissions with a gentle upward wrist motion that pushes a call button located on the right bottom side of the walkie-talkie watch. This wrist-operated function works just like a standard PTT call button, which is additionally located on the face of this walkie-talkie watch. Other features of the AGPtek wristwatch walkie-talkie include auto-scan channel search, call alert signal capabilities, and compatibility with standard headphones and earbuds. The rechargeable lithium-ion batteries provide a 24 hour standby time and up to five hours of talk time, making this walkie-talkie watch a reliable choice for any outdoor situation. The Flexzion digital wristwatch walkie-talkie is another great choice for convenient communication. Its stylish lightweight design makes the radio comfortable to wear, and it has an array of features that add value to your purchase. This Flexzion walkie-talkie watch has multi-channel capabilities with an auto-scan feature to help cut down on interference during voice transmissions. It has an easy to use design and LCD backlit screen that makes it perfect for use during the day or night! The Flexzion walkie-talkie watch has a 500 mW power output that boosts the signal and gives it a communication range of up to 3 km, or nearly two miles! This range makes it an ideal communication device for outdoor recreation or staying in touch with friends and family as large public venues. As with the other walkie-talkie watches reviewed, this Flexzion model operates on lithium-ion batteries and comes standard with battery chargers and headsets for convenience and hours of recreational fun! When you think of a walkie-talkie, what generally comes to mind is the standard handheld device used by children and adults alike for recreation and communication. The advances in technology have opened up a new world of walkie-talkie use by integrating the features of these standard handheld devices into the convenience of a wristwatch design. With several features that come standard on traditional walkie-talkies, the walkie-talkie watches are a great alternative for hands-free, on the go communication. Now that you have decided to purchase a walkie-talkie watch, where do you begin? While the product options in the wearable walkie-talkie market are smaller than those for standard two-way radio devices, there are several key features to be aware of before choosing the model that works best for you. The durability and battery options for walkie-talkie watches are fairly standard across the market and hold their own with the features of regular handheld walkie-talkies. With any two-way radio, it is important that the device is able to withstand harsh environments and rugged usage since they are generally used during physical outdoor activities. Reliability is a key consideration in the search for the right walkie-talkie, and walkie-talkie watches are a great option for most outdoor enthusiasts. Of the various walkie-talkie watches reviewed, the battery life was fairly standard across the board. All of the models operated with lithium-ion batteries that are rechargeable and long-lasting, adding value to the consumer. Additionally, the Vectorcom model comes with an AC adapter to make charging the walkie-talkie watch more convenient. Each of the top walkie-talkie watch models reviewed stated that battery life would last for 24 hours of standby communication, although as expected, under continuous communication usage the battery life for all models is greatly reduced. The AGPtek walkie-talkie watch that we reviewed boasts the longest continuous usage time of five hours. All of these numbers are comparable to standard handheld walkie-talkies, and reviews were positive across the board for battery life. None of the walkie-talkie watches we tested had waterproof capabilities; however, each of them made claims of tough durability for the average user. With thoughtful, rugged design, the walkie-talkie watches we reviewed are sure to hold up to typical usage in outdoor environments. The range of a walkie-talkie is one of the main considerations when looking to purchase a two-way radio device. The range of standard walkie-talkies depends on the model, but most of the higher end standard two-way radios can be effective in a range of up to 20 miles or more depending on the terrain and environmental factors. Walkie-talkie watches are more limited in their standard range capabilities than a typical walkie-talkie radio. Of the walkie-talkie watches we reviewed, the longest range capability was found with the AGPtek device which advertises communication capabilities of up to 6 km or just over 3.5 miles. The other models reviewed had shorter range ability of around 3 km. Although this is a far cry from the 20 to 40 mile claims of high-end standard walkie-talkies, walkie-talkie watches still give the user decent coverage for most applications. Despite walkie-talkie manufacturer claims, the terrain and environmental conditions play a big role in the overall range in which you can communicate clearly with any walkie-talkie device. Flat, uninterrupted terrain provides a longer range signal, while dense forest or interference from structures such as houses and other buildings will cut down on the distance that your walkie-talkie watch can cover. All of the walkie-talkie watches that we tested had multi-channel capabilities and auto-scan features. Being able to switch between different channel frequencies gives you the ability to reduce any interference that may be present when communicating with your partner. The channel auto-scan available with these walkie-talkie watches is a nice added feature that allows you to quickly and efficiently find a frequency that will provide you with a clear signal. All walkie-talkies work with either FRS or GMRS channel frequencies, and it is important to have a basic understanding of what the differences between the two are. FRS, which stands for Family Radio Service, devices generally have shorter ranges and can be less reliable than a standard GMRS device. Walkie-talkies that use GMRS, or General Mobile Radio Services, channels have a range of at least five miles but usually a great deal more. So how do you know what type of walkie-talkie is right for your needs? If you need the ability to communicate over very large distances with reliable service, then a walkie-talkie or walkie-talkie watch with GMRS channels is the best option for you. For the typical recreational user, walkie-talkie watches that operate on FRS channel frequencies is a more than adequate option. An additional consideration when purchasing any two-way radio device that uses GMRS channels is the legal issues of transmitting over those channels. In order to communicate on a GMRS channel, you must first apply for a license from the Federal Communication Commission, which is then good for five years before renewal is required. None of the walkie-talkie watches that we reviewed stated that a GMRS license would be required for use. The range, durability, and channel options of walkie-talkie watches are all important features when deciding on a product that will live up to high consumer standards, but what other features are unique to walkie-talkie watches that set them apart from the crowd? Walkie-talkie watches come with many of the standard features of traditional walkie-talkies, but the watches that we reviewed had several key characteristics that made them stand out in a competitive market. 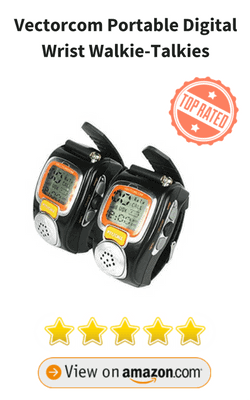 Walkie-talkie watches are great for communication when friends and family, but they also function as a standard watch! All of the walkie-talkies we reviewed had back-lit LCD screens for ease of use in low-light situations, as well as 12 hours AM/PM time display. The LCD screen also contains all the information you need to operate your walkie-talkie watch, such as channel frequency and battery life. One of the best features of using a walkie-talkie watch is the freedom you have by wearing your walkie-talkie! All of the walkie-talkie watches that we looked at had a comfortable, light-weight design that made them easy to wear even when doing a physical activity such as hiking or playing sports. Both the Flexzion and Vectorcom walkie-talkie watches reviewed advertised having a hands-free VOX mode to allow you to use the radio without interrupting your activities. The AGPtek model stood out from the crowd with its unique wrist-operated technology. This clever communication feature allows you to activate the talk key with a simple upward motion of the wrist while also keeping the option of using the traditional PTT key on the watch face. It was clear that all of the models of walkie-talkie watches we reviewed developed their products with the consumer in mind, and the little details go a long way! From the back-lit LCD screen to electronic volume control, many of the features of a standard walkie-talkie radio can be found in these walkie-talkie watches. All three of the reviewed walkie-talkie watches offered headphone jacks compatible with most headphones and earbuds, and the Flexzion model includes a headset with the purchase of the product. Walkie-talkies have a vast array of uses in the professional and recreational worlds. Children and adults alike can have hours of enjoyment using walkie-talkies with friends and family. Walkie-talkies are also important for safety and security purposes when participating in outdoor activities and sports. While standard walkie-talkies may have the ability for increased range, walkie-talkie watches are ideal for the average outdoor enthusiast. By combining all of the best features of typical two-way radios with the convenience of hands-free communication, walkie-talkie watches are at the leading edge of the walkie-talkie market. Additional features, such as voice activation capabilities, long-lasting rechargeable batteries, and built-in safety features make the choice to purchase a walkie-talkie watch an easy one to make! All three of the walkie-talkie watches we reviewed received high marks in testing and have many satisfied reviews from customers across the country. By determining the features most important to you in a radio communication device, you will be able to find the perfect product to suit your needs.